Of late, I’ve been thinking of acorn squash. About slicing, then baking each half to a deep golden color. Alas, it’s not the season for acorn squash. 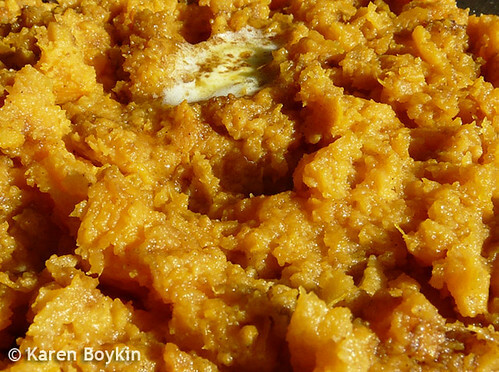 But, for me, there is a nutritious substitute for the taste and texture of baked acorn squash: sweet potatoes! Admittedly, prime time for sweet potatoes is in the fall but it’s worth eating them out of season when you find 3 or 4 good-looking tubers. Here’s what I did, from start to buttery finish. Scrub potatoes under running water; remove the pointed ends. If they’re large, save some cooking time by cutting them in half. Place potatoes in a foil-lined pan. Mix thoroughly and taste. Adjust proportions to your liking, then set aside. Bake the potatoes for 45 to 90 minutes, depending on the thickness of the potato. Check on them after about an hour. If the skin is dark and the flesh is tender, then your spuds are done. Let them cool a bit before handling. Cut the potato in half, scoop out the flesh and discard the skin. I chose to keep the skin on mine, so I cut each potato into small sections then mashed it with a fork. If you want a smoother finish, use a potato masher or a ricer. Before serving, dot your sweet potatoes with butter or your favorite butter substitute, then sprinkle the cinnamon-ginger sugar on top. The oohs, aahs, and yums are sure to follow. Previous Previous post: Too hot to haiku? Next Next post: Don’t throw those strawberries out!